Following the latest global craze around AR game Pokémon GO, Grab Malaysia + Hotlink jointly launch four limited edition PokeMobiles – the latest, safest and fastest way to hunt Pokémons. In anticipation of the game, both Grab and Hotlink announced that for the first two days following the launch of the game, all Pokémon GO players can book a free ride to the nearest PokeStop by selecting the PokeMobile button on their GrabApp. Since Pokémon hunting is known to be energy-draining for both players and their phone batteries, each of the PokeMobiles are specially equipped with Grab Goodie Bag, water and Hotlink PokeChargers for your phone. To help all Pokémon Master aspirers level up even faster, PokeMobile riders who are also Hotlink customers will get an extra advantage in the form of FREE USD100 worth of PokeCoins via Hotlink Cash Online. This is equivalent to 14,500 PokeCoins, which players can instantly exchange for additional gaming advantage. Hotlink Cash Online is simply your Hotlink credit that can now be used for purchase of apps or in-app items such as PokeCoins in Google Play store. In addition, Hotlink customers will get 10% off their PokeCoins every time via Hotlink Cash Online. And 10% off for in-app purchases on their favourite games and apps like Clash of Clans, Clash Royale, Smule, Loong Craft, Crisis Action, Mobile Strike, Castle Clash, Lords Mobile, Candy Crush Saga, Candy Crush Soda and Last Empire World War Z, every single time on Google Play Store. “We are aware there is a huge Pokémon following in Malaysia and we wanted to join in the trill of the game. As Grab has always been focused on providing safe, comfortable, convenient and affordable rides, we wanted to encourage and help Pokémon Trainers hunt for the Pokémons while traveling from one PokeStop to another safely. 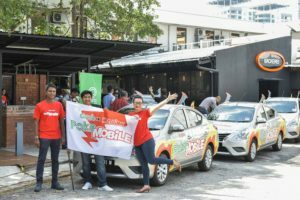 In addition to our exclusive PokeMobiles, players can truly enjoy an immersive Pokémon Go experience and up their ante as each car comes equipped with a special Grab goodie bag, water and a car handphone charger for uninterrupted gaming pleasure,” said Jaygan Fu, Country Manager of Grab Malaysia. “Hotlink Cash Online’s ambition is to give Hotlink customers the convenience of a single currency for all their app and gaming needs. Before today, our customers could already use their credit to make purchases for popular PC games and mobile apps such as DOTA, League of Legends, Clash of Clans, Clash Royale, Smule and many others. With 10% off apps & games, we are very excited to make in-app purchases more accessible to every single one of our Hotlink customers with a faster, easier way of making Google Play purchases with their Hotlink credit. It’s super effective!” said Navin Manian, Maxis’ Head of Prepaid. Pokémon Go is an evolution of the 1990s video game which is now enabling players to take on the role of “Pokémon Trainers” and venture out beyond the video game to the real world via augmented reality while watching the interactive maps on their screens to hunt, catch, collect, and train the digital creatures. For more information about Grab and Hotlink’s partnership on Pokémon Go, please visit www.maxis.com.my/googleplay and grb.to/pokemobile.